Three Top 25 upsets and one overtime contest highlighted Week 2 of NCAA Women’s Water Polo Action. Six teams return to the best eight from last year, while Vouliagmeni and Sant Andreu managed to join the top flight. The biggest casualty of the prelims was Dunaujvaros, as the Super Cup winner side couldn’t make the cut this time. The USA Men’s National Team earned second place at the FINA World Championship qualifier following a 12-10 shootout loss to Brazil. The USA Men’s Water Polo National Team punched its ticket to the 2019 FINA World Championship in Gwangju, South Korea today with a 21-4 win over Argentina. The USA Men’s National Team is one step away from qualifying for the 2019 FINA World Championship following an 18-9 win over Canada yesterday in Brazil. Sarah Snyder (UCSB) and Maud Megens (USC) were the top goal scorers on the week with 14 apiece. Megens’ efforts put her over the 100-goal barrier for her career. Here’s a look at the best of the best performances from each conference on Week 1. 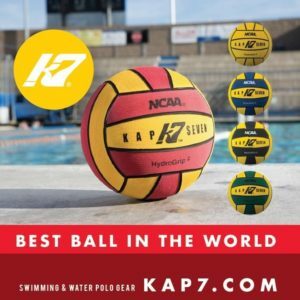 Berkeley and Riverside, California are the center of the collegiate women’s water polo universe on Week 2 with all but six matches taking place in those two locales. The women’s Euro League kicks off on the coming weekend and the current stage has never looked so tough as this season’s preliminaries. The USA Men’s National Team picked up their second straight win at the FINA World Championship Qualification Tournament, defeating Brazil 15-4. Both group leaders Recco (ITA) and Jug (CRO) went on winning and closed the first half of the prelims with a perfect score-line. The top six teams in the nation held their position in the Collegiate Water Polo Association Top 25 poll after opening weekend. The biggest movers of the week were UC Santa Barbara, San Jose State and Fresno State, along with Azusa Pacific, which made its season debut in the rankings. Jadran Herceg Novi (MNE) and Marseille (FRA) used the home advantage to win the first leg of the respective Euro League semifinals. By visiting the Lounge, water polo lovers can watch exclusive video contents from the respective clubs, free live streaming of each game, highlights and the top goals of each round. The USA Men’s National Team opened play at the FINA World Championship Qualification Tournament in Brazil with a 22-7 win over Argentina. In Group A the next two games of Ferencvaros (HUN) and Brescia (ITA) might be decisive for the top ranks just as the big clash of the round between 2016 champions Jug (CRO) and title-holder Olympiacos (GRE) in Group B.